Masutatsu Oyama was born Yong-I Choi, on July 27,1923 in Southern Korea. While still an infant, Oyama was sent to live with his sister, on her farm in Manchuria, in Southern China. At the young age of nine, Oyama began to receive instruction in the southern Chinese Kempo style of Shi Pa Lo Han Sho (eighteen hands) from a Mr. Yi, who at the time worked on the farm. Oyama returned to Korea at the age of twelve and continued his training in Korean Kempo. He also became interested in judo and boxing. His interests led him to the Takushoku University where he began to train with Gichin Funakoshi. By the age of twenty, Oyama had attained the rank of Yondan; 4th degree black belt. He trained simultaneously in Judo. His progress in Judo was amazing, earning him the rank of Yondan in four years. Oyama then began training with the Master So Nei Chu of the Goju School of Karate. It was Master So who advised Oyama to dedicate his life to the Martial Way and to commit himself to three years of rigorous training in the solitude of the mountains. So in 1946, Oyama went to a remote spot on Mount Minobu in the Chiba prefecture of Japan to begin his training. He was accompanied by his student Yashiro. After six months however, Yoshiro was unable to bear the solitude, and fled the mountain. A friend, Mr. Kayama, visited Oyama every month to deliver food and supplies. However, after fourteen months, Mr. Kayama announced that he was unable to continue this arrangement. This ended Oyama’s training which had lasted just over a year. In 1947, a few months after his return to society, Oyama won the first Japanese National Martial Arts Championship. Yet, he was unsatisfied and felt there was still much to be gained. He deeply regretted not completing the three years of intensive training. It was then that Oyama decided to dedicate himself completely to Karate and began another period of training alone on Mount Kiyozumi. Oyama trained twelve hours a day. His regimen consisted of physical training, fasting, misogi (meditation under waterfalls) and study of Zen and philosophy. He used trees and stones to strengthen his techniques, and bench pressed his body weight 500 times daily! After eighteen months of rigorous training, Oyama was ready to leave the mountain and confidently face his future. In 1950, Oyama began his famous barehanded battles with bulls. He fought 52 bulls (which were to be slaughtered) in all, killing three instantly, and taking the horns off 49 of them with his powerful knife hand blows. Oyama’s intent was not to be cruel, he simply wished to demonstrate to the world, his powerful Karate. Oyama traveled to the United States in 1952 and engaged in 270 matches against boxers, wrestlers, Judo, and Karate fighters, and defeated every one. Matches lasted no longer than three minutes and were often won with one blow. In 1953, a grass lot in Mejiro, Tokyo served as Oyama’s first “dojo”. In 1956, he opened the Oyama Dojo in a former ballet studio behind Rikkyo University. By 1957, the enrollment had reached 700 members. 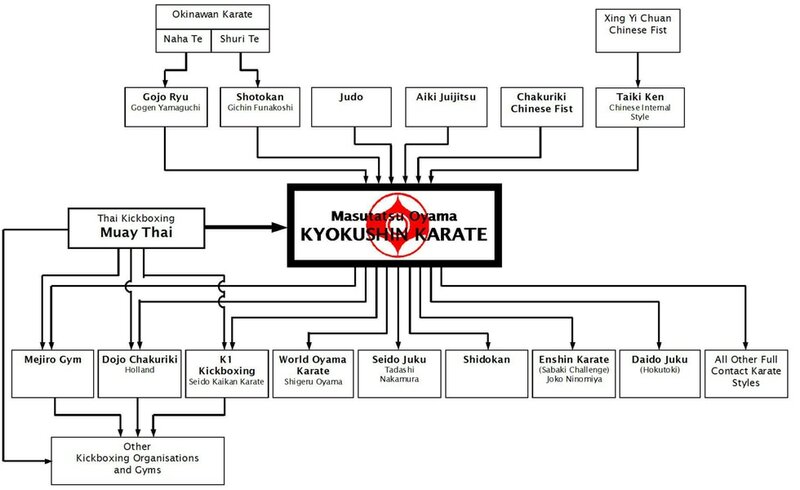 Oyama opened the organization’s world headquarters in Tokyo in 1964 and subsequently adopted the style name Kyokushin, which translates as “the ultimate truth”. Oyama’s Karate continued to spread to 123 countries with over 14 million members. Kyokushin, today, continues to spread worldwide. Oyama firmly believed that hard training could greatly benefit any person, both physically and spiritually, and that practitioners would thus play a part in making the world a better place.